Hello, I’m Eileen Twichell and I’m a senior trainer and consultant with Corporate Education Group. A project manager is only as successful as his or her team. That’s why it’s so important for project managers to have a thorough understanding of team dynamics, behaviors and most importantly, Tuckman’s model of group development. 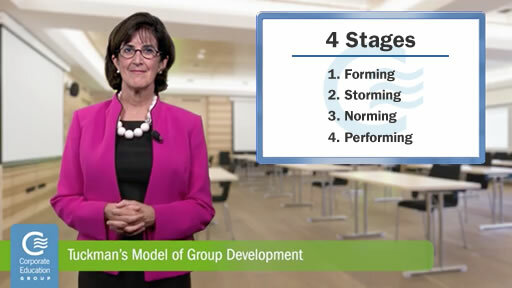 Tuckman’s model asserts that every group is always in one of four stages: forming, storming, norming or performing. Each of Tuckman’s stages of group development is not only necessary, but a healthy part of a team’s evolution so they can effectively face challenges, identify solutions and deliver results. Forming: This stage occurs when the team is newly formed. Project managers might consider this the “honeymoon” phase since team members typically exhibit their best behavior while they gauge the personalities and work ethics of their colleagues. The project manager should encourage the team to interact and get to know one another. However, it is also important to set ground rules in writing. Provide a document that outlines roles, responsibilities and goals in order to avoid any misconceptions. Storming: As they say, the honeymoon is over. During this stage, team members are more comfortable with each other and start to speak out. Conflicts are inevitable, but the project manager’s reactions are crucial. To ensure that your team develops out of this stage, steer clear of the "my way or the highway" approach. Instead, be accessible and listen to your team while encouraging them to resolve their own conflicts. Step in if you know you can help, but hold them accountable to their behaviors, actions and responsibilities. Norming: During the norming stage, team members settle into more normal behavior and find mutual ground. As the project manager, you will most likely find that the team is relying on them less, yet is not completely independent. Performing: During this stage, the team develops into a high-performing unit that is able to accomplish goals with minimal conflict. Each individual contributor is knowledgeable and driven to get the job done. Even though the team is at its best, the project manager is still highly involved. During this stage, continue documenting, ask questions and pay attention in order to prevent the team from regressing.